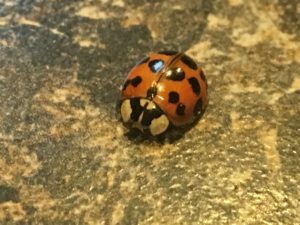 Not to be confused with Lady Bugs although they are in the same family, Asian beetles are known to be a nuisance for people living in Illinois. In mid-fall farmers in our area (Streator, Ottawa, LaSalle, Peru, Oglesby, Pontiac, Etc) start to harvest the corn and beans leaving these Asian Beetles to look for food and shelter elsewhere. This typically means our homes. They come in swarms and crawl through the smallest cracks in windows, doors, and under siding. Although these beetles can be a pest, they can be beneficial in many circumstances. These two beetles look very similar, but have a couple of distinct visual appearances to tell them apart. Lady bugs are red in color and have a black head with smaller white spots on the sides. Asian ladybugs have additional white spot on the back of the head and range from light to dark orange. The Asian Beetle also can have 0-19 spots. The Asian Beetle is a beneficial insect for many summer months. When eggs first hatch they will start working right away. They will eat larvae from aphids and scale. However, as they mature their diet consist of large aphids and may eat fruit off trees. Asian beetles do not have many predators, which is one reason why their population is so high in the fall months. Asian Beetles are attracted to warm and light surfaces. This means that houses that have light siding will have beetles attracted to the south and west sides of the house. Shaded houses tend to have less infestation in the fall. The best way to keep the insects out is to ‘batten down the hatches’ by caulking around windows, make sure weather stripping is tight, vents are covered with a screen, and doors are not left open. You should check your siding to make sure that there are no cracks for the beetles to climb through. On a positive note, these beetles do not reproduce or eat during the winter months! After the physical changes are applied, beetles will still probably get into homes. These insects should be vacuumed up and disposed of right away outside. Crushing the Asian Beetles will only leave an odor and possible stains to walls or furniture. You don’t want to make additional work for yourself. Insecticides can be used, but labels should be read before spraying, particularly indoors. We recommend Hi-Yield Indoor/Outdoor Spray. Again I want to emphasize READ LABELS BEFORE USE! 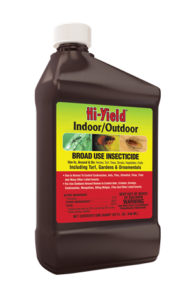 For outdoor use only (for behind shutters, along gutters, etc) you can use Hi-Yield Kill-A-Bug.